ONE SHEET ORIGINAL MOVIE POSTER 1992. MADE EXCLUSIVELY FOR CANNES FILM FESTIVAL PREMIERE. For 1000's of Vintage Movie Posters. 26 3/4" x 39 1/2". One sheet ORIGINAL MOVIE POSTER issued by the studio when the film was released and meant for theatrical display. The rarest one sheet for this film! Created exclusively for the premiere at the Cannes Film Festival. This poster has several minor imperfections. Not in perfect shape but still very presentable. M inor wrinkles and some light foxing (light brown spotting, very hard to see in our photo) in the bottom credits. Very little general storage wear. No tears, no tape, no pin holes. Our extra large photos generally speak for themselves. We do not always list every little defect. We try and list any that we think are important or those that may not be readily visible. We realize that nobody likes surprises. Some additional defects this poster may or may not have: fold or edge wear, pin holes, general storage wear, writing or tape on the back, tears, stains, dirt, minor cross fold separations, etc. If we have described this poster as UNUSED, it will NOT have any tape or pinholes but still may contain some very light storage wear. If a vintage poster is in terrific unrestored condition like this one (EX C8 or better), many experienced collectors will place a premium on it (when compared to a linen backed/restored one). Most experienced collectors prefer unrestored items to restored ones because they believe they will appreciate more in value. It is a REAL ORIGINAL MOVIE POSTER issued by the studio when the film was released and meant for theatrical display. We are absolutely certain it is authentic. We use super strong hi-quality packaging materials including thick cardboard, masonite, and costly pvc plastic pipe. (Please see below for details). It will answer any questions you may have. C8 Excellent - Investment quality. C7 Very Good to Excellent - Fine condition. Still a very nicely preserved item. C6 Very Good - The typical used poster in average condition. C5 Good to Very Good - A heavily-worn item. C4 Good - Below average but still suitable for display. C3 Fair - Heavily worn, but yet still complete. C2 Poor to Fair - An extremely worn, possibly even incomplete item. C1 Poor - The lowest grade, representing items in the lowest possible condition. Some of our posters are "between grades". For more information about CineMasterpieces please see. We guarantee that all posters we sell are graded and described accurately. Unless otherwise specified in the description, ALL POSTERS ARE ORIGINAL MOVIE POSTERS original theatrical movie posters that were displayed or meant for display (unused) in theaters at the time the movies were released. We will put in writing that we guarantee it to be an Original Movie Poster. 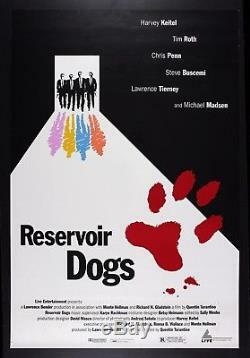 The item "RESERVOIR DOGS CineMasterpieces ORIGINAL MOVIE POSTER CANNES FILM FESTIVAL'92" is in sale since Wednesday, September 13, 2017.